Our Parkland® Wood Blinds are precision crafted from the finest North American hardwoods, including genuine oak and cherry, and display beautiful natural grain and color variations. Harvested from responsibly managed forests. Rich colors … bright, modern stains … Parkland®Classics® wood blinds offer our widest selection of paint colors, stains and slat sizes, so you can find just the right design for your home. EverWood® TruGrain® – our most comprehensive collection of alternative wood blinds in realistic grain patterns built to withstand heat and humidity. Choose from popular stains, and flat and beveled options. 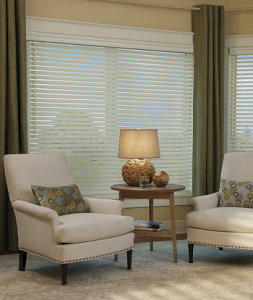 EverWood® Distinctions®Featuring a best-selling color selection of whites and creams, Everwood® Distinctions® alternative wood blinds can bring a bright, classic look to any room in which heat and humidity abound.